Most entertainment in Senegal takes place in the form of socializing. Life takes place on the street, and on a Saturday night, it is not uncommon for residents to sit outside and mingle with their neighbors until 3:00 or 4:00 a.m. There is no end to the pleasure taken in simply being in the company of one’s large family and friends. Solitude is not especially valued, but rather the well-being of the family and community. Given that Senegal is predominantly Muslim, there are guidelines as to what is considered acceptable entertainment. These guidelines vary depending on whether one is in the countryside, which is more heavily orthodox, or the city, which practices a more European approach to entertainment while remaining within basic tenets of Islam. Entertainment in the country may involve more events devoted to the practice of both singing and talking about the presence of God. These include singing and drumming and a particular kind of traditional Senegalese dancing that involves much jumping. In both country and city, attire worn to such events is strictly traditional. In Dakar city, there are clubs for young people to go dancing. There is no drinking age, since most young people in Dakar observe the Muslim rule of no drinking. For Senegalese youth, abstinence from alcohol is by far the norm; it is difficult for a young person to drink without socially feeling somewhat stigmatized and separated from his or her peers. There are a variety of clubs, some for young teenagers, others for those in their twenties. The music is usually traditional Senegalese and African dance music, with occasional European pop. Parents are secure in allowing their children out in the city since families are so large, that siblings will always keep an eye on one another. There is some cultural tension about young people's dressing in western fashion. From time to time, there are edicts that outline the punishment for failing to uphold the values of Islamic modesty. Out of respect, young women sometimes wear sarongs over western outfits when on the street. Traditional dancing is an art form that is closely woven into all social celebrations. Since Senegal is not a culture that promotes artistic stardom, the most famous singers and dancers in Senegal only perform in conjunction with some other event, like a birth celebration or a wedding. Even when a performer appears in a club, it is understood that he or she is present and performing only as an adjunct to the dancing. 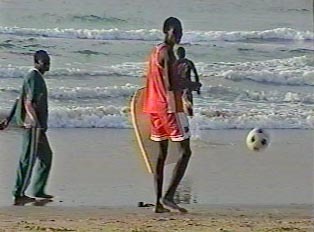 The beach is a large part of life in Senegal, used both as a place to swim and relax and also as a place to go for religious cleansing ceremonies. Although one can swim year round, the main months are June through October, the hot season. From November through May, people go to fish or to perform cleansing rituals in the sea. It is not uncommon for groups of young people to go to the beach as part of a night out. American, European or Hindi films are shown at single screen movie theatres. Senegalese films are never shown in the theatres but can be rented at video stores or watched on TV. Watching a video at home with one's family is a very popular pasttime. Soccer is by far the most beloved sport of Senegal and is played avidly by children on the streets. When there is a national or international soccer event, the entire country unites in the pleasure of watching and supporting their team. When Senegal plays in the World Cup, each day there are many parties and banquets, accompaniesd by official speeches from the mayor and other officials. Wrestling is also a favorite sport; the wrestlers are adorned hours before the match with talismans and oils. A cleric comes to bless the ceremonies, and then there is an extended period of traditional singing and dancing. Wrestling matches are always attended by a high degree of official ceremony; it is not unusual for the president, as well as other noted artists and officials, to attend. Although there are hours of celebrating and preparing beforehand, the match itself usually takes only a few minutes. "Making Plans for the Weekend"
"Getting Ready for the Party"
"Hanging Out in the Afternoon"